This discovery could have a huge impact on AMR as it opens up new opportunities, but also brings new challenges. 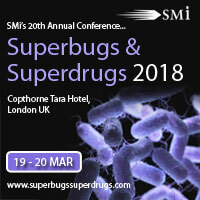 Taking place in London on 19 – 20th March, the theme for the SMi’s Superbugs & Superdrugs Conference is to tackle the scientific, regulatory and economic challenges to combat AMR. Join us to hear exclusive case studies on clinical progress and evaluate the latest incentives and funding solutions to build your antibiotic pipeline. We are pleased to be able to include Christopher Houchens’ (BARDA) presentation from the last year’s Superbugs & Superdrugs Conference, where you can find information on BARDA’s Mission, Funding Antibacterial Development, National Strategy and Action Plan for CARB, Insufficient Pipeline, Industry Disengagement, BARDA’s Goal, Strategy and Priorities, WHO AMR Priorities, Portfolio Partnerships, What to Expect from CARB-X. Hear current updates on the above from Mark Albrecht, Health Scientist, HHS/ASPR/BARDA who will be presenting at the Superbugs & Superdrugs Conference this March. – Don’t miss the chance to raise your company’s profile – get in touch with Alia Malick on +44 (0)20 7827 6168 to discuss how!